Holotypus m [von *holo-, griech. typos = Prägung, Typ], das von einem Autor bei der Beschreibung einer neuen Art festgelegte (designierte) „typische“ Individuum (Typus-Verfahren der taxonomischen Nomenklatur). Nach den erst im 20. Jahrhundert strenger festgelegten internationalen Nomenklaturregeln muß es ein einzelnes, entsprechend gekennzeichnetes Exemplar sein. Bei Sexualdimorphismus kann entweder nur das Männchen oder nur das Weibchen der Holotypus sein; das „typische“, Individuum des anderen Geschlechts gilt dann als Allotypus. In Zweifelsfällen gelten nicht die Angaben in der Artbeschreibung, sondern die tatsächlich am Holotypus feststellbaren Merkmale. Auch gilt der Holotypus weiterhin, wenn später festgestellt werden sollte, daß er aus einer für die gesamte Art gar nicht typisch aussehenden Population stammt. Er soll wegen dieser großen Bedeutung für Nachuntersuchungen in öffentlich zugänglichen Sammlungen verwahrt (deponiert) sein, in der Regel in großen Museen. auct., Belegexemplar, Paratypus, Typus. A holotype is a single physical example (or illustration) of an organism, known to have been used when the species (or lower-ranked taxon) was formally described. It is either the single such physical example (or illustration) or one of several such, but explicitly designated as the holotype. Under the International Code of Zoological Nomenclature (ICZN), a holotype is one of several kinds of name-bearing types. In the International Code of Nomenclature for algae, fungi, and plants (ICN) and ICZN the definitions of types are similar in intent but not identical in terminology or underlying concept. 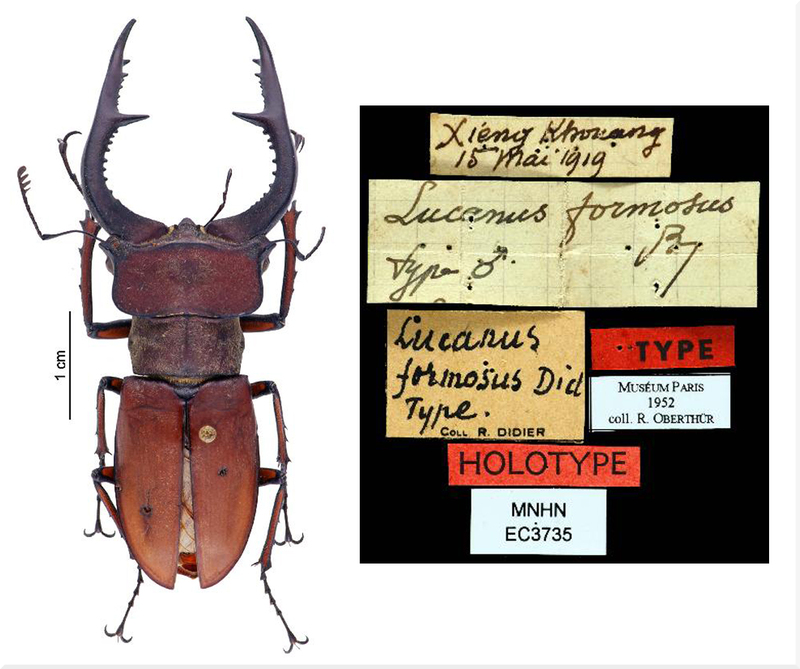 For example, the holotype for the beetle “Lucanus formosus” is a preserved specimen of that species, held by the Muséum National d’Histoire Naturelle (MNHN) at Paris. An isotype is a duplicate of the holotype, and is often made for plants, where holotype and isotypes are often pieces from the same individual plant. A holotype is not necessarily ‘typical’ of that taxon, although ideally it should be. Sometimes just a fragment of an organism is the holotype, particularly in the case of a fossil. For example, the holotype of Pelorosaurus (Duriatitan) humerocristatus, a large herbivorous dinosaur from the early Jurassic period, is a fossil leg bone stored at the Natural History Museum in London (NHM). Even if a better specimen is subsequently found, the holotype is not superseded.